I realize that I have been holding back at releasing the demo because I’ve been chasing perfection. Let’s be honest, if it were perfect it would be the full game wouldn’t it? 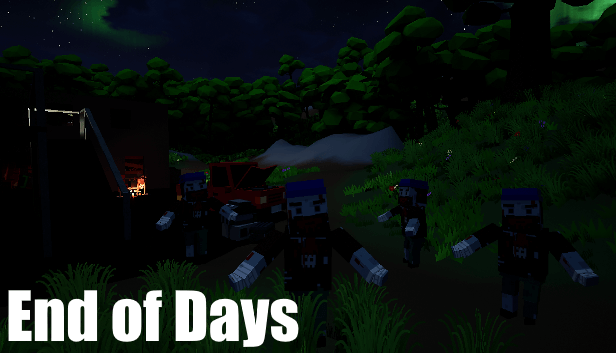 So without further ado, here is End of Days v0.1.0 filled with bugs and all their glory. Speaking of bugs, the very first bug is that you need to start the game, close, and reopen it for it to work. I don’t know why. I hope this tiny demo gives you a taste of what’s coming and trust me there is a lot coming. Please be kind, I’ve put over 300 hours into this project already. Again please be kind, I’m going to fix the bugs in a patch. Then we can move on to the better stuff. Like the damn doors and windows. How i can start map in woods? Because no zombies there…!? I would love that actually. I’m going to fix the forums page as soon as I can. It would be great to get some conversation in here.